The continental climate in Madrid makes winter there quite colder than in other places and to bear the harshness of winter, there’s nothing better than sitting in a warm room while enjoying some good hot dish. To the typical soups and stews, we can add in these winter days a delicious cup of hot chocolate with churros, a perfect treat to enjoy any time of day. With a long track record in the Spanish cuisine, not only does hot chocolate help warm you up, but also provides a number of health benefits: it is a source of calcium, reduces stress, lowers blood pressure and ‘bad’ cholesterol -thus reducing heart disease risk- and contains flavonoids, which have antioxidant, anti-inflammatory and analgesic properties and improve insulin resistance. Although hot chocolate is consumed virtually in all Europe and America, each country has its own way to make and serve it. The Spanish variation is a bit thicker than the drink’s version in Switzerland or the U.S.A and is often served with churros (straight or bent sticks of fried dough), getting an excellent balance between the bittersweet flavour of chocolate and the salty touch and crispy texture of the churros. 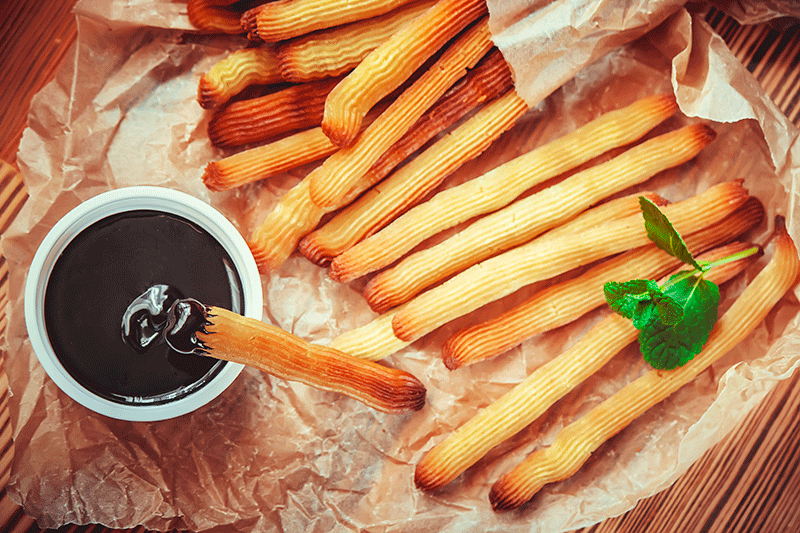 Nearly all bars and cafés serve churros with hot chocolate, but the typical place to enjoy this treat is a churrería. One of the most popular locals of this kind in Madrid is Chocolatería San Ginés, close to Puerta del Sol. Established in 1894, its great success has led the company to open shops in different countries. It’s open 24/7 all year round. Quite near, also in the Puerta del Sol area, you can find La Mallorquina, a patisserie founded the very same year, and Chocolatería Valor, with a wide range of gourmet chocolate varieties. It is also worth mentioning La Antigua Churrería, in Barrio de Salamanca. Established in 1913, the company has shops in different parts of the city and home delivery service. So, if you don’t feel like having your churros with hot chocolate at a crowded place, you can have it delivered or you could also walk for 10 minutes to Churrería Madrid 1883, at 8 Espíritu Santo street (Malasaña), to stock up on churros and then make some chocolate in the kitchen of your luxurious apartment at Génova 5 to have it freshly made. If you want to cook it the traditional way, heat some milk with chocolate chunks and stir until they melt; then bring to a boil and serve immediately. You’ll love it!